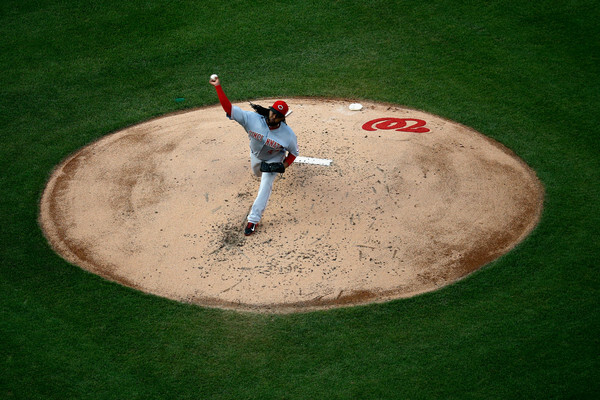 There was no way Johnny Cueto was coming out of this game in the ninth inning. Not before, and not during. The Reds are showcasing the durability of their workhorse ace – 122 pitches later he shutout the Nationals in Washington and beat Max Scherzer soundly. The Reds gave Cueto a little tribute tonight, staking him to five early runs. Cueto struck out eleven and walked one. It was an absolutely dominant performance. It certainly seems like a forgone conclusion that the Reds will be supplying teams with some weaponry here soon, with Cueto headlining those names. I remember Cueto’s first start ever – it was April 3rd, 2008 against the Arizona DiamondBacks in Cincinnati. He had similar stuff on that day, striking out ten and walking only one. The only hit he gave up that day was a sixth inning home run to Justin Upton. From right there I knew Cueto was a special international talent the Reds were lucky enough to grab somehow. He’s gone 91-62 with 11 complete games and five shutouts in his career as a Red. He’s tallied 1106 strikeouts and just 385 walks. His ERA pitching half his starts in a bandbox is around 3.20, phenomenal. These eight years that have passed by have went by all too quickly. You look back at the memories and realize that he’s probably the best Reds pitcher to wear the uniform in a couple of decades. As you think about the memories, you remember that night he pulled the muscle in his side in 2012 in San Francisco. You start thinking about ‘what if’. If he doesn’t, the Reds just might (and in our opinion) probably go to the World Series that year. The Giants flag that flies forever from 2012 should have belonged to the Reds. Perhaps Cueto moves on elsewhere to get that postseason glory with another team – we have a feeling he will – and if he does good for him. He’s been a quiet guy that has stayed out of trouble and made headlines for the right reasons. A team shouldn’t really ever have to part with a Johnny Cueto but it’s just not in the Reds fortunes or pockets to be able to contain him. Baseball is still after all; a business. Cueto doesn’t need us to eulogize him as a Red, he did that just fine tonight. It’s been a pleasure getting to watch this guy every fifth day and to see him pitch a handful of times in person. He’s the epitome of what an ‘ace’ is in baseball right now.